Time to Rejuvenate & Repair Your Body. Goodbye Winter. Hello Spring! Includes full health history intake, diagnosis, herbal and nutritional consultation with full acupuncture treatment. Herbs & supplements not included. You will be given instructions where to find them. Please note I do not sell anything! I love using ear seeds during and after an acupuncture or tapping session to maximize the positive effects of the treatment. Ear seeds are safe and can be taken off by the patient. I have also been incorporating the ear seeds infused with aromatherapy to help reduce stress and promote weight loss. A special acupuncture protocol that helps boost the immune system, relieves stress, calms the mind and improves circulation. You will be on the table face up. Please wear loose clothing. 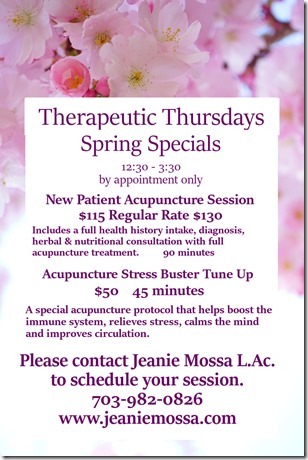 Please note that this session is not intended for any specific ailment or pain. Please schedule a full acupuncture session for a full treatment tailored to your needs. 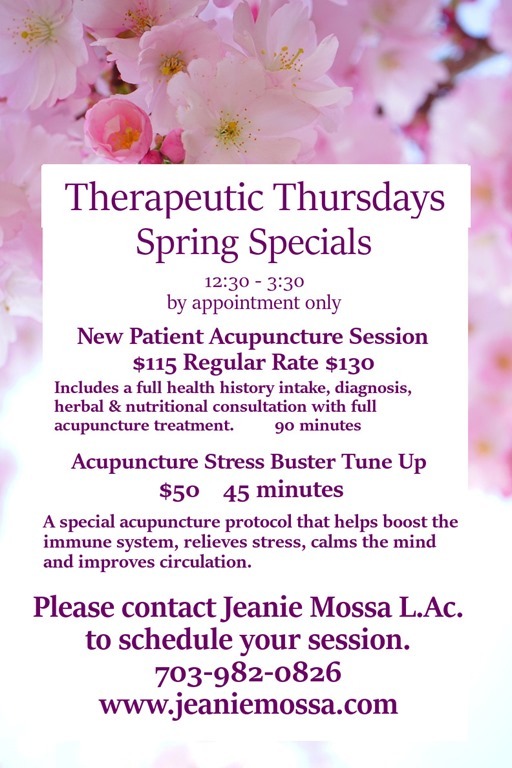 This entry was posted in Acupuncture Alexandria VA and tagged acupuncture 22314, acupuncture alexandria jeanie mossa, acupuncture alexandria va jeanie mossa, acupuncture back pain alexandria va by jeanie. Bookmark the permalink.